In 2011, after it has completed its mission to investigate the equivalence principle, the Microscope satellite will become another spent piece of space debris in an already cluttered low-Earth orbit. CNES, as a signatory to international treaties committed to reducing space debris, has come up with an original method for deorbiting Microscope: IDEAS, an ultralight structure that will slow the satellite in much the same way as braking parachutes are used on certain fighter aircraft; only IDEAS will be deployed for much longer. The IDEAS system lowers the satellite’s orbit. By increasing the drag on the satellite exerted by the rare atmospheric particles still present at this altitude, this sail will speed up the natural decay of its orbit. The trickiest phase of the mission for an ultralight structure will undoubtedly be the moment it is deployed in the weightlessness of space. For this reason, a series of microgravity tests were recently conducted on the Airbus Zero-G aircraft operated by Novespace. During the microgravity phases of the recent parabolic flights, a model boom 1 metre long was inflated with an inert gas (nitrogen). “The idea here was to validate initial unfolding of the tube,” says Loïc Boloh. “We used another model to test deployment of 2 related thin-film membranes that will be used as a sail. 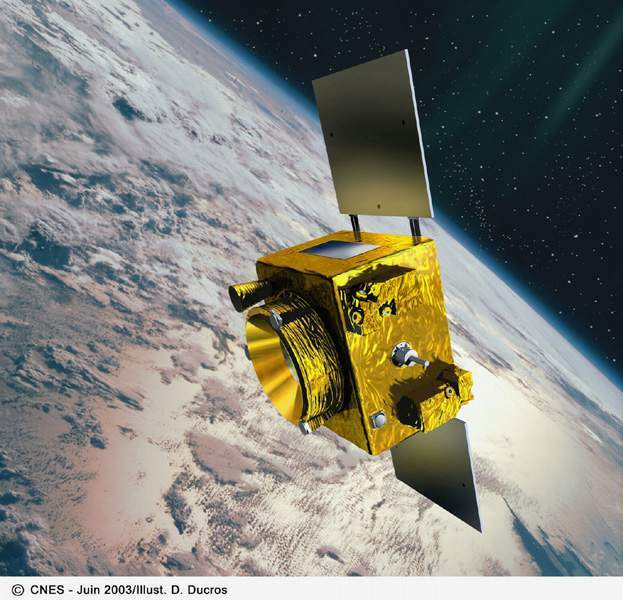 We learned a lot from this experiment.” In particular, the tests allowed CNES, which has drafted the specifications for EADS ST to assure the system’s compatibility with the Microscope satellite bus, to fine-tune sail deployment control parameters. The operational impact of the folding method was also tested. To fit under the launcher fairing with Microscope, the boom and sails must take up a volume of no more than 60 cm x 60 cm x 10 cm, and weigh no more than 12 kg. To meet these tight specifications, engineers had to use exceptional materials like Kapton, a very-thin-film polymer with low temperature sensitivity that makes up most of the sail. The Kapton is laid on a grid of Nomex, another highly heat-resistant fibre. And to prevent the sail from tearing during its 25-year odyssey in space, aluminium to protect against solar ultraviolet radiation and silicon oxide to counter atomic oxygen corrosion were also used. These ultralight structure deployment tests, the first to be performed on parabolic flights in Europe, were a great success. On the strength of these very promising results, CNES will be pursuing the fruitful engineering collaboration with EADS ST thanks to which Microscope will one day set sail and head back to Earth.